Made to meet the demanding needs of professional level road and mountain bikers, these X-Socks Biking Pro Socks are lightweight but loaded with technical advances and comfort benefits. 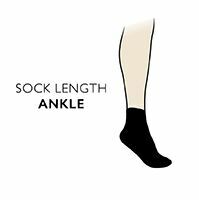 Swiss engineered and crafted in Italy, these mid-calf socks combat all the main threats to performance, such as blisters, bruising, cramp, irritated skin, overheating and moisture; they even inhibit foot odour. Patented fabric technology, in SkinNODOR, Robur and Mythlan fibres, protect all aspects of your feet by producing a fabric that is bacteriostatic, breathable, anti-allergenic and with a cushioning hollow core to its strands. X-Socks Biking Pro Socks incorporate self-adjusting cuffs for a comfortable, slip-free fit, ankle stabilising X-cross bands, left/right shaped footbeds and hollow core Robur-based protectors strategically placed at any and all stress and impact zones, right through to the toe-tips. A system of AirConditioning and AirFlow channels ensure a supply of fresh air to keep feet temperature controlled and dry, removing used warm, moist air. Despite their lightness, finely woven X-Socks Biking Pro Socks are also made to be extremely durable, with special increased wear areas to help them go the distance, making them perfect for even the toughest tracks.